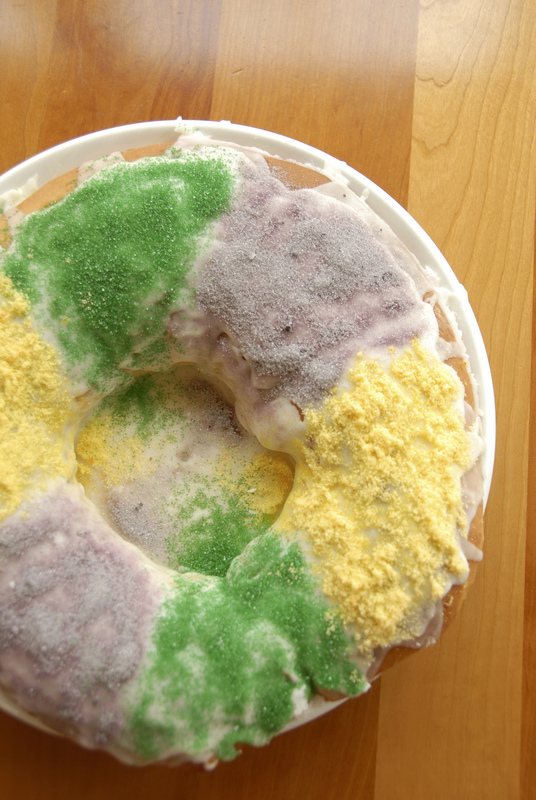 In the U.S., king cakes are baked during the period from Epiphany to Ash Wednesday. The tradition celebrates the coming of the Three Kings to worship Christ. justice, faith and power. There is also a tradition of hiding a tiny figurine of the Christ child in the cake. Whoever finds the baby Jesus in their piece of cake has to make the next cake! This recipe comes from our covenanted sister Debbie Vaughan, who died in 2011. Debbie’s daughters and Shreveport branch members still use her recipe. Julia (Vaughan) Hendrix remembers her mom making this king cake every week between Epiphany and Mardi Gras. “We all love it!,” Julia says. The Vaughans sometimes divide the dough in half to make two smaller cakes with different fillings. Another favorite filling option, instead of raspberry cream, is to sprinkle sugar, brown sugar and cinnamon over the dough before rolling it into a wreath. Cream together cream cheese, butter and powdered sugar. Set aside preserves. Combine ingredients and mix until smooth. Place sugar into three jars with tight-fitting lids. For each jar, drip the food coloring onto the sugar, close the lid, and shake vigorously for about one minute. Adjust color with additional food coloring and repeat if the color is too light. 1. Combine water and sugar and add yeast. Stir gently. Let sit for five to ten minutes, until mixture begins to bubble. Then stir in oil and salt. Add flour one cup at a time, until it forms a ball. Knead the dough on a floured surface until it is soft and smooth; add more flour if dough is too sticky. Place the dough in a large bowl that is greased with oil. Roll the dough in the bowl to coat it with the oil. Cover the bowl with a damp cloth and place to rise in a warm place for about 1 ½ hours or until the dough is double in size. 2. Punch the dough down. Then roll it flat on a floured surface to make a long narrow rectangle, approximately 30 by 10 inches. Leaving the edges bare, spread the cream cheese filling, followed by raspberry preserves, lengthwise down the center of the dough. Place the king doll on one of the long edges. Then roll up the dough lengthwise, with the doll rolled into the center, to make a long tube shape. With wet fingertips, pinch together the lengthwise seam and the ends. Carefully place the dough on a greased cookie sheet, shaping it into a wreath. Let rise for 30 minutes to an hour. Bake in a preheated oven at 350 degrees for 15 minutes or until golden. 3. Allow the cake to cool slightly for three minutes, then transfer it to a serving platter and spread on the powdered sugar frosting. Decorate with bands of purple, yellow and green sugar.